The new Ford Mondeo Diesel Estate is an excellent car that, despite being bigger than the Hatchback variant, is actually better looking. It’s safe, well-appointed and it’s comfortable and quiet. It’s not quite as entertaining to drive as last time, with Ford watering down its handling. But it’s still great to drive and has overall maintained its “everyman” image that’s made it so popular with buyers down the years. Ford have been making cars for over a century. Read our brief history of Ford to find out more about this manufacturer. OSV takes a closer look at what it’s all about with our 2018 Ford Mondeo Diesel Estate review. The Mondeo came to be known as the car to go for if you wanted to have some fun behind the wheel. In 2018, it’s not as much fun as it used to be, but it can still offer an engaging driving experience. Although no longer the sportiest model in the range, we think buyers will be happy with the compromises. Ford have softened up its suspension, and this is certainly something that your passengers will appreciate at least. The light steering ensures the large Mondeo is easy to drive in the towns and cities, and it never feels quite as big as it looks. Two-wheel-drive is standard on all models except the largest diesel, which comes with four-wheel drive as standard. However, you can fit four-wheel-drive to the smallest models, and it arms you with more grip. In terms of its engines, there’s just one diesel available. This is a 2.0-litre engine that’s offered with three separate power outputs. The smallest variant develops 148bhp and can get you from rest to 62mph in 9.4 seconds. That’s impressive, but the bigger 177bhp variant covers the same sprint in just 8.3 seconds. However, it never feels as fast as those numbers suggest. As mentioned, both these variants come with two-wheel-drive as standard, but you can specify four-wheel-drive should you wish. Doing so adds grip but blunts performance significantly. With four-wheel-drive fitted, the 148bhp variant covers the 0-62 dash in 10.5 seconds, while the 177bhp covers it in 9.5 seconds, which makes it over a second slower than the two-wheel-drive version of the same engine. Rounding off the range is a 207bhp variant of the same 2.0-litre diesel engine. It comes with four-wheel drive as standard. The Mondeo is well-built, easy to get comfortable in, and easy to park. It’s clearly been designed with ease-of-use in mind, as the steering wheel and driver’s seat offer lots of adjustability. And despite being so large, it’s actually easier to park than the hatchback variant, largely because of a slab-faced rear end. Parking sensors can be added for an extra £450, too. Insulation is much better than last time, and the Mondeo is a relaxing place to spend your time on the road. All models barring the entry-level trim come with an 8” touchscreen that’s freed the dashboard of the kind of button clutter that used to mar its interior design, as well as the brand’s latest SYNC3 voice-recognition system. There are better quality materials used for the interior trim this time around, and the car no longer rattles on the move. Is the Ford Mondeo Diesel Estate practical? It’s spacious but there are bigger cars in this class. However, we’ve got few complaints in regards to its usability. It doesn’t share the hatchback variants sloping roofline, and this frees up headroom. The large windows create an airy, light atmosphere, and there is more than enough room for two adults to sit comfortably in the rear. The doors open nice and wide for easy access, and storage solutions are plentiful. The boot, meanwhile, measures 525-litres, which makes it smaller than last time. Fold the rear seats and you can extend it to 1,780-litres. Are Fords reliable? Read our honest assessment of the manufacturer. The entry-level Style model is fairly sparse, but it does get an anti-theft alarm, cruise control, climate control and 16” alloys. The Zetec model adds electric windows up front and in the rear, sat-nav, a fast-demisting windscreen and a sportier exterior. We like the Titanium model best. It comes with ambient interior lighting, sat nav and automatic headlights and wipers, as well as safety kit like lane-keeping assistance and traffic sign recognition. The Vignale rounds things off with a concierge service, a different styling makeover and quilted leather upholstery – but it is expensive. In terms of how safe the car is, Euro NCAP scored it 5/5 for its crash test performance. The car scored very well for child and adult occupant protection, and because it’s constructed with stronger materials this time around, we have no concerns over its safety. However, a lot of its advanced safety technologies are optional extras. These include road-sign recognition, lane-keeping assistance and blind spot monitoring. Prices for the new car start at £22,195 and rise to £32,695 for the Vignale trim. For more information on our leasing deals, you can check out our page here. In terms of its running costs, the 2.0-litre TDCi 177bhp diesel can manage returns of 62.8mpg economy when it’s fitted with a manual gearbox. It emits 117g/km of CO2, which is also very reasonable. Our preferred model, however, is the smaller 148bhp variant of the same 2.0-litre diesel engine. It returns 67.3mpg at best and has a BiK rating of 25%. Buyers can add four-wheel-drive to either of these engines but doing so bumps up fuel costs considerably. For example, the 148bhp variant manages 57.7mpg at best, while the 177bhp variant’s economy drops to 53.3mpg. It’s no longer the best car to drive in its market but the Mondeo is still a real pleasure. It actually looks better than the Hatchback variant. A lot of its advanced safety kit is missing from the entry-level model, but if you invest in the Titanium trim you’ll be getting a very safe car indeed. It’s smaller than last time and way off the Passat. 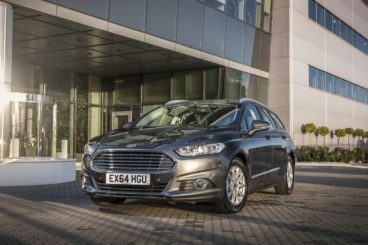 Let’s see how the car fares against its rivals in the comparison section of our 2018 Ford Mondeo Diesel Estate review. 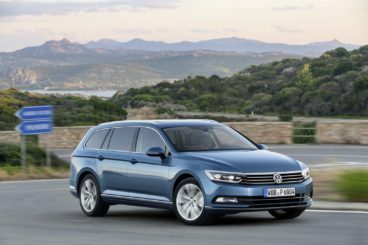 The new Volkswagen Passat Diesel Estate is easily one of the best cars of its type. It’s stylish, upmarket and hugely spacious. Out on the road, it might not be the most fun car you’ll ever drive, but it’s refined, responsive and quiet. What more could you ask for? Moreover, because the Passat now shares its mechanical bits with the likes of the SEAT Leon and the Audi A3, it’s more engaging than ever. It weighs considerably less too, which has boosted both its handling and its economy. In terms of its engines, a 1.6-litre TDI diesel might be the entry level pick, but it’s far from underpowered. That said, the 2.0-litre 148bhp TDI is the highlight. It’s performative and economical and covers the 0-62 dash in 8.9 seconds. It makes overtaking a piece of cake, and it works well as a relaxing motorway cruiser. A 188bhp TDI sits in the middle of the range and has a 0-62 time of less than 8.0 seconds. If you want to go even faster than that, you’ll need to check out the range-topping 238bhp BiTDI model. It’s as fast as a sports car, has a 0-62 time of 6.3 seconds and a max speed of 148mph. It does, however, seem faintly ridiculous for British roads. Running costs? The entry-level 1.6-litre TDI is the only model capable of returning over 70mpg, but economy is good throughout the range. The 2.0-litre 148bhp diesel is good for 67.3mpg with the 6-speed manual transmission, but truth be told no Passat is what you’d call expensive to run. Inside, quality is high, with the Passat sharing a lot of its equipment and materials with other top-notch Volkswagen Group products. 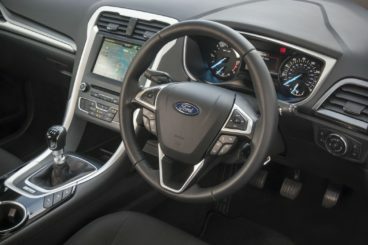 The materials used here are better than those in the Mondeo, and the cabin has a very upmarket feel to it. There lots of soft-touch plastics here and there and build quality is faultless. Is the Volkswagen Passat practical? It seems almost like a silly question to ask of a car that has a 650-litre boot, large rear doors, and an extended wheelbase. That said, it’s actually shorter than last time, and while interior storage is good, it could be better. Buyers will be happy with the big glovebox, however, and there’s more head and knee room in the rear than last time. The new Vauxhall Insignia Diesel Estate is one heck of a good looking car that knocks spots off all conservatively styled Estate’s. On the road, it’s mighty accomplished. It won’t rock your socks for entertainment, but it’s so effortless to drive that you’ll find it hard to believe you’re behind the wheel of an Estate car. It’s comfortable over long distances, visibility is excellent and ride quality is generally good – at low speeds it’s fine, but it gets a bit jerky as you pick up speed. The steering is precise and direct but it is a tad too light and doesn’t offer as much communication as we’d like. In terms of its engines, a turbocharged 1.6-litre 108bhp diesel sits at the bottom of the range. It’s going to feel underpowered for most buyers who’ll likely prefer the 134bhp variant of the same engine. It covers the 0-62 dash in less than 10.0 seconds, which is still a sluggish-sounding time, however. Both those engines struggle to pull away from traffic with much haste, something the more flexible 2.0-litre 168bhp diesel has no problem with. It makes high-speed cruising look easy, but as good an engine as it is, it’s only offered with the SRi and above model. Rounding off the range is a 208bhp diesel that powers the GSi model. It has a 0-62 time of 7.4 seconds but never feels that fast. Running costs? The 1.6-litre 108hp diesel is the smallest in the range, and also the cheapest to run. It can return 64.3mpg economy on a good day and emits just 112g/km of CO2, which gives it a BiK rating of 24%. The 134bhp variant of the same engine fares well economically too and can return 61.4mpg at best. The 2.0-litre 168bhp diesel, meanwhile, is good for 53.3mpg. Inside, the Insignia has a cabin that’s almost – but not quite – up there with the best this class has to offer. Ride quality and insulation both impress us, while Vauxhall have made improvements where material quality is concerned. The look and feel of the dashboard is better, although the Insignia – nor the Mondeo – still can’t compete with the Passat for overall quality. 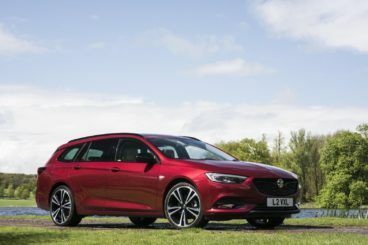 Is the Vauxhall Insignia Diesel Estate practical? It’s super spacious and Vauxhall have used its dimensions well. They’ve also increased its size, and headroom is now much better for rear seated passengers than it was last time. In fact, everyone who sits in here is treated well. Storage solutions are also good and include a decent-sized glovebox, while the boot measures 560-litres. Fold the rear seats and it increases to 1,655-litres, which is a big improvement on last time. Familiarity might breed contempt – but not where the Mondeo is concerned. Buyers who’ve always been a fan of this car will enjoy the direction it’s heading in. It’s still great to drive, still practical and it looks more stylish than ever. Optional four-wheel drive bolsters things up, a great safety record is reassuring and the engines are powerful and economical. The new Ford Mondeo Diesel Estate doesn’t reinvent the wheel, but it didn’t need to.